Children in Leven will soon have a brand new state-of-the-art play area, after over £80,000 refurbishment programme. 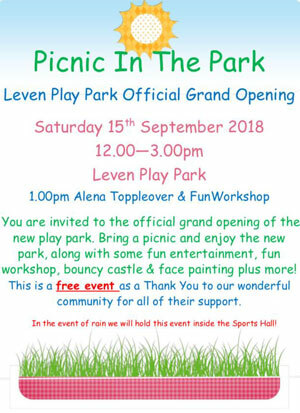 Work has just been completed at Leven Play Park which will be opened on the 15th September. The improvements to the site include a brand new toddler play area, swings and two climbing orbits with slides poles for both young older kids, plus new seating area for parents and much more. Leven Playing Field Fundraising Group and Community are celebrating the successful fundraising project to refurbish their village Play Park. After nearly two years of planning grant applications and community fundraising events, the vision of one individual that grew into a community fundraising project. A grandmother who regularly took her granddaughter along to Leven Play Park area first raised the renovation needs with the Parks owners The Leven Playing Filed Association a Charity organisation. The Playing Field Association rely on donations and fundraising and who had no ready available funds. This resulted in the birth of a campaign to update its design and introduce new equipment for the park. After successful grants applications being posted on social media news of the campaign spread, after which a community fundraising group started up to raise funds through community run events which in matter of a few months raised over £5000. The Fundraising Group of four, Kath Noble (a grandmother) Parents Amy Thomson. Sarah Fordham and Gemma Ward parents along with volunteers within the community worked together to raise funding through individual events run within the village of Leven. Kath Noble the originator of the campaign said, what started of as being a campaign to refurbish the Play Park, as grown into something far bigger, in that we have come together as a community working together towards the same aims and goals. “We have been delighted with the different ways that people have shown their support. Whether it be helping with suggestions on the park’s design through to helping to champion the cause and getting directly involved with the fundraising efforts. This has been a real community effort that has seen residents of Leven, local businesses and individuals, organisations and funders uniting for the good of our village. This is a great example of community coming together sharing a vision of what people want to see in Leven . The commitment and fundraising efforts of those dedicated local parents and residents have been outstanding, they’ve driven this project and championed the improvements to the park for everyone to enjoy. “This collaborative fundraising effort, led by the parents using this park every day with their children, has captured support from the wider community which is great to see. They really want to do something for Leven and so far, their efforts have been extremely successful. I’m really excited and cant wait to see the children and families enjoying the Park.